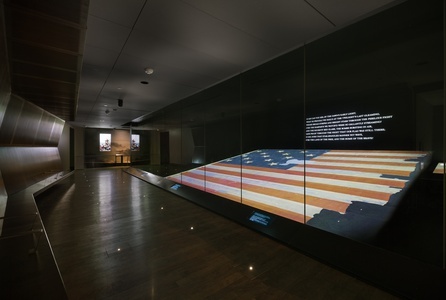 …the centerpiece of the renovated museum—the American flag that inspired Francis Scott Key to write his famous poem—has never looked more magnificent. 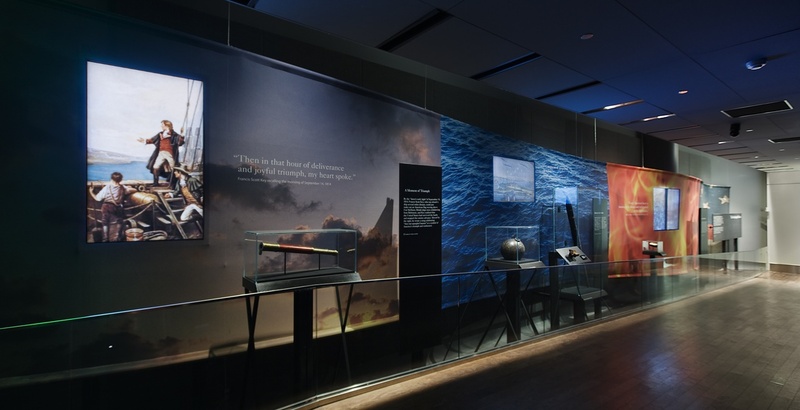 It’s inspiring as it sits behind a 35-foot glass wall in a theaterlike space, dimly lit to recall 'dawn’s early light.' 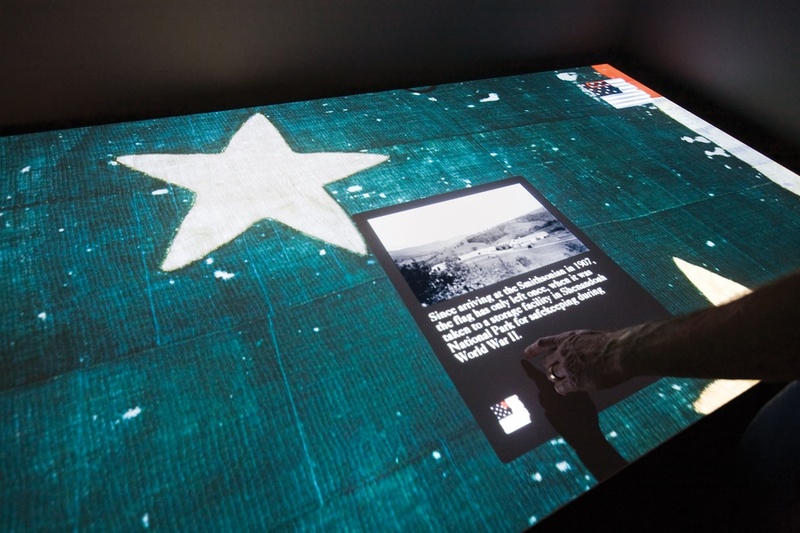 – The Washington Post (Read more press) This permanent exhibit places one of America's greatest treasures in the heart of one of the most visited museums in the world, inside perhaps the largest display case ever designed for a single object.Within the viewing chamber, a large interactive table allows visitors to virtually examine the flag up close. The design presents the huge, fragile textile dramatically while also protecting it from light and gravity. The flag appears in near darkness reminiscent of "dawn's early light". The design evokes a memorial in the nation’s capital, rather than a typical museum exhibit. Long entry and exit corridors mediate the shift from daylight to the darkened gallery and incorporate dramatic audio-visual experiences. Within the viewing chamber, a large interactive table allows visitors to virtually examine the flag up close. 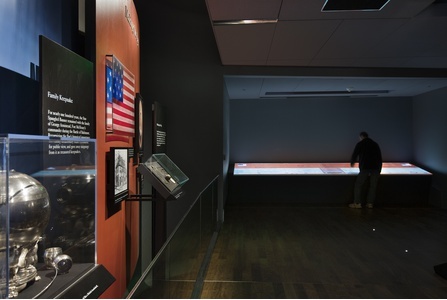 Design for the Star-Spangled Banner Permanent Exhibition was led by Jonathan Alger of C&G Partners in collaboration with Tom Geismar of Chermayeff & Geismar Studio. Architects: SOM. Final AV design: RBH. 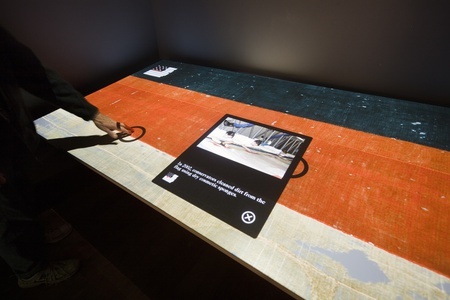 Final interactive table design: Potion. Exhibit lighting designer: Technical Artistry. 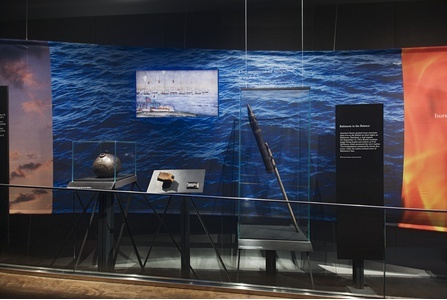 Architectural lighting designer: George Sexton Associates. Structural engineers: Robert Silman Associates.